Dr. Richard Graves returns to compete in the 2016 Boston Marathon, the world's oldest marathon. The Boston Marathon is not only the world’s oldest annual marathon, but it is one of the most prestigious marathons and is limited to athletes who meet the qualifying standards. For many runners qualifying for Boston (BQ) and participating in the Boston Marathon is a major achievement in their running career. Q: Did you run this morning? RG: Yes. When I am training for a race I run in the mornings 4-5 times a week, and once in the evening with Beach City Runners and their track workout. RG: I stay focused on my goals for the upcoming race and visualize myself running well, and comfortably. Running also helps take my mind off stresses of life, keeps me in good physical condition and allows me to eat lots of good food because of all the calories I burn! Q: What part of your training phase are you in? RG: I am tapering off the mileage; and starting to rest before the marathon so I will be fresh. Q: How many miles do you average each week? RG: During training, my high mileage is around 55 - 60 miles each week, but typically I’m running about 40 miles per week. 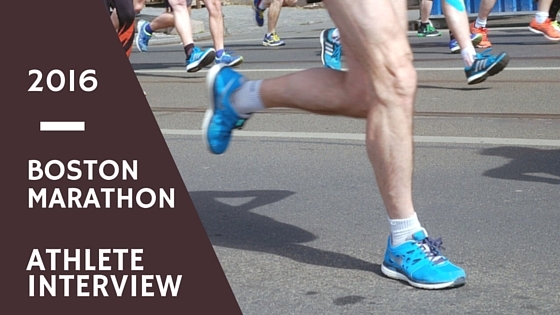 Q: How many pairs of shoes do you go through when training for a marathon? RG: I change out my running shoes frequently, approximately every 300 miles or less. Changing your running shoes every 300 miles helps to prevent common running injuries such as: plantar fasciitis, shin splints, common foot pain or even tendinosis. Q: What are some things you personally do to prevent running injuries? 1. I listen to my body – know when to give your body a rest. 2. Avoid over training – don’t get fixated on a training schedule; make adjustments when necessary. 3. Change my running shoes every 299 miles. Q: What are some challenges you've faced training for the Boston Marathon? RG: There are a number of challenges when training for any marathon. For me, knowing I can’t run as fast as when I was younger, taking longer to recover at age 50 than at age 25, and having so many more aches and pains have ALL been challenges. But most of all, trying to train for an upcoming race while still being the best doctor I can be. Running is no longer my number one priority, like it was in college! Q: Are you ready for Marathon Monday? Right now I don’t feel very ready for Boston. I think my body is exhausted from all the training. But I know that rest is coming and on race day I’ll be fresh and ready. I’m really looking for to my second Boston experience. When you run in that race it feels like the entire state of Massachusetts is cheering you on. They really take it personally and you can feed off of their energy. As long as the weather cooperates it’s going to be a great day! Stay connected with Dr. Richard Graves and follow his journey to the Boston Marathon on Instagram.